Packing tape dispenser handle for 2” packing tape. 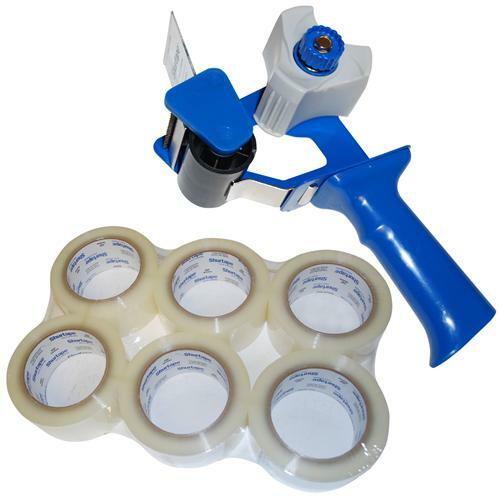 Also called a tape gun, this dispenser is a side loader and makes taping your moving boxes much easier. Lightweight and durable, this tape dispenser is portable and easy-to-operate. This packaging tape dispenser has a pistol-grip design that allows the operator to apply and cut the tape in a fluid, one-hand motion. This tape dispenser is a necessity when products are being processed, repackaged or prepared for distribution. Ease of use and durability gives this tape dispenser consistent and superior performance.